For this final mindmap update, I created nodes for Louis Althusser’s State Apparatuses (ideological and repressive) and Stuart Hall’s principles for “Encoding/Decoding,” under the heading Cultural Studies. I decided on naming this collection Cultural Studies I had previously read these two essays in a Cultural Studies course and they deal with how the populace is (in a manner) indoctrinated by the dominant class to stay subsurvient as cheap labor within the cycle of means of production, or how the masses are actually receiving messages and meanings through media outlets and changing those meanings in response. I linked out this heading to Rhetorical Theories, CHAT, Social Network Theory, and Foucault because I feel like what is going on within each of these, what is moving within those networks has to do with how and what people are processing. For Althusser, I made a node that lists his examples of Ideological State Apparatuses (ISAs) as well as a smaller list of his examples of his Repressive State Apparatuses (RSAs). The last node I made for Althusser was his discussions about ISAs being around us from birth onwards and how school is the most influential of these because students are obligated to attend an institution that is constantly having them operate within ideology (especially ideology that promotes ideas of freedom and liberty equated with education, though the reality is often quite different). For Hall, I made nodes that included two quotes about the circuit of production, and an image of the two-way communication between producers and consumers of media. I linked the node with the heading Encoding/Decoding with a quote from Foucault about “Enunciative levels of formation” because I feel like, for many of us, the discursive moments Foucault is talking about requires a constant taking in and releasing back out of messages and meanings as we come across them, as we produce our own responses, and as our responses reach other people, with the cycle moving on with or without further input from us. Last week’s concept groupings focused on theories; this week’s focuses on theorists (although, to be honest, I’ve not been adding individual theorists for the last few theories). I also added and linked in Social Network, Ideological Determinism, and Ambience as the final three theories we’ve addressed in the class. 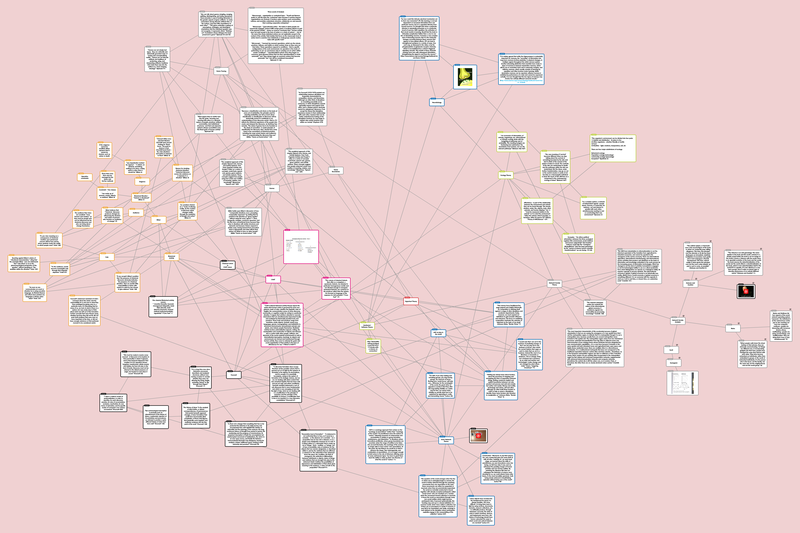 I wanted to have the full picture of all theories/theorists before I finished concept groupings. And here are the results! At long last, mapping is complete. What appears above is the final mindmap of theorists and theories as they exist in my head. Coming to the end of the experience, I’m reflecting on what I’ve learned about networks and network theories through this map. Hierarchy vs. Rhizome: While a chronological mapping of theorists’ ideas might suggest primacy among certain theorists’ ideas — earlier theories are more influential than later theories, meaning later theories are built on the hierarchical foundation of earlier theories — the map reflects a far more rhizomatic relationship among theories. I’ve been as likely to connect theories based on chronological influence as conceptual influence, regardless of chronology. Foucault reflects certain ideas from Ambience as easily as Ambience reflects certain ideas from Foucault. The relationship among theories is conceptual, and concepts are eternal, always already existing (according to ambience theory). Ambience, a Ring to Rule them All: Ambience is a fantastic closing theory because it sums up the direction theorists have taken throughout the semester. While ambience sometimes seems to present a certain level of mysticism, its focus a post-network ecological relationship among rhetors and rhetoric, audience and affect, environment and ideas acts as a contemporary summing up of all that we’ve read and reflected on all semester. And it also suggests an openness to what will come in network theory, a willingness to concede that we can’t possibly know, or even imagine, that which is withdrawn and hidden at this moment when it comes to network theories and understandings. I connected Ambience to every other theory in my mindmap. RhetComp Got it Going On: We may be fractious and divided, but we rhetoric and composition teachers and scholars propose some cutting-edge theory (as English studies theories go, anyway). While we’ve not proposed string theory or chaos theory, we’ve willingly addressed the consequences and contributions of advanced scientific theories on rhetoric and composition. I drew as many lines to my Composition/Rhetoric node as to my other concepts; those lines represent theories that either directly or indirectly addressed rhetoric and/or composition, or theories that emerged from a rhetoric and composition background. We really do study all the things — and we like it that way! The Order of Things: My minds races from idea to idea, drawing connections whenever possible. My internal dialog often seeks to organize the chaos. This has been reflected in my desire to tie things together in the mindmap in concrete shapes, especially columns and diamonds. Popplet affords such preferences when “snap to grid” is enabled — however, because I intended meaning to exist among placements in the map, I never opted to allow Popplet to put content in columns. I did that myself in several places. 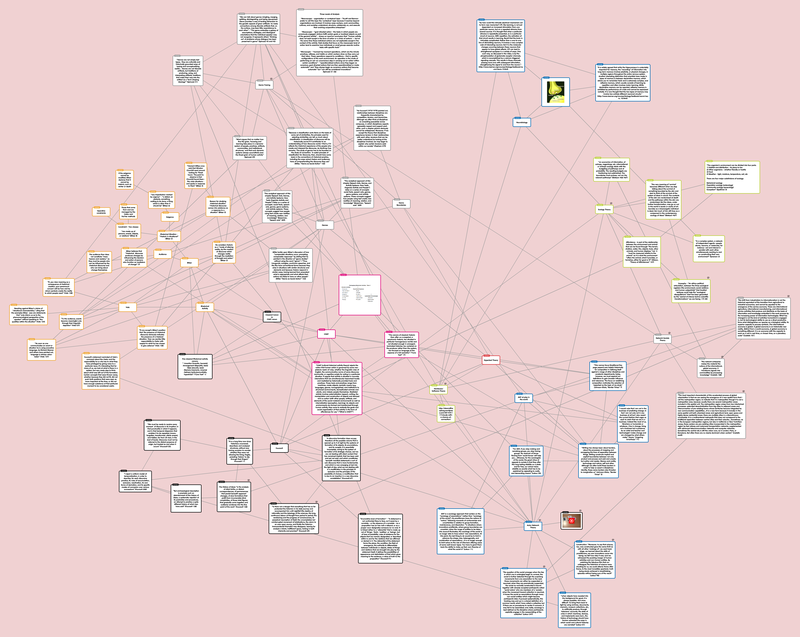 I struggled to keep the mindmap manageable; this last week, I struggled on my 24” monitor to see everything in the map in order to connect items on the outskirts. It’s time to let the mindmap rest. Reflections: The Order of Things (above) is really about on-the-fly reflection and my unwillingness to allow ideas to remain chaotically (maybe rhizomatically) related for long. As a writer, I’m an editor on the fly. As a scholar, I’m a reflector in the fly. I seek to place concepts in relationship to one another as soon as possible. The danger, of course, is that by so quickly (and very un-ANT-like) categorizing theories, I overlook potential connections that I missed the first time around. This brings me to the value of the mindmap, sometimes hated though it was. A mindmap enables both node-level focus and network-level attention. I never quite escape the big picture. While I remain locally-focused when adding nodes, connecting nodes forces the shift to global view. This helps me tame the organizer in me. A Final Thought: Like Dumbledore’s pensieve, the mindmap encourages objective reflection, a moment of god-like oversight. Truth be told, after our readings this semester, I’m beginning to believe that objectivity is false. In fact, I’m beginning to believe the subject/object binary is false and limiting. 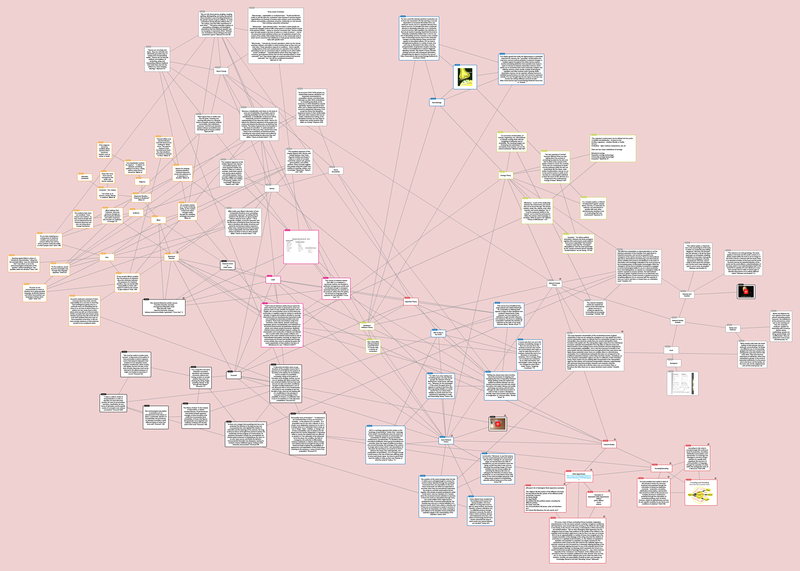 Which suggests that the mindmap might simply be my response to the already-always-existing relationships between already-always-existing theories. And my place is neither objective nor subjective, but ambient, connected to the mindmap and its ideas in an ecology of meaningful relations. I, too, have a place in the mindmap.